Members along with their families had a get together at the Great Offsite – a camp site very close to nature and only 12 kms from Chandigarh. 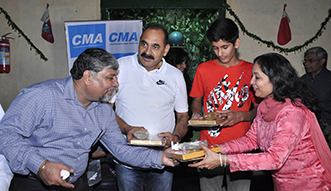 Before each of the member gets busy in his Diwali celebration, which was falling on 19th October 2017, CMA thought to arrange for pre-diwali celebrations with CMA members and their families. Around 80 peopleparticipated in this Diwali celebration. The message of cracker free Diwali was very well passed on the participants by celebrating Diwali only lighting candles and diyas. Children had a good time playing cricket, football, cycling and many more games to choose from the large collection made by the Great Offsite team in their unique sports museum. Members enjoyed participating in cultural performances. Enjoying delicious food and drinks with family and friends, at a beautiful place very close to nature made a wonderful Diwali celebrations out of the busy city life. All the participants were presented with beautiful personalized gift tags, set of dozen clay diyas, gifts and various discount vouchers.